Paul Kelly, president of the San Jose POA in California, makes a powerful case for reconciliation. About a month ago, I was working in full uniform in a marked police vehicle when I was pulled over to the side of the road in our downtown area. I watched two young African-American teenagers, each one probably around 18 years old, walking across the street right in front of me. Both couldn’t take their eyes off me. They both stared at me with what appeared to be anger and disgust. It occurred to me that the feelings these two young men appeared to display towards me, as a law enforcement officer, were at least partially attributable to the current attacks on our profession all across the nation. Whether they cite Ferguson, New York, South Carolina or a different incident, those fanning the flames of discontent seem intent on driving a wedge between police officers and minority communities, whether deserved or undeserved. All police officers and departments are being tarred with the same brush. Citizens of all ethnicities and police officers need to try to better understand each other. We police officers are used to citizens being less than thrilled to see us. Some react to receiving a ticket, others to a perception that if a cop even looks at you it portends some type of (usually negative) law enforcement interaction. For cops, staring back is part of the job. We are trained to be constantly looking for suspicious persons or activity, and to take instant action to address it. Now, however, the dynamic is changing. The minority citizen may really believe that you are looking at him or her based only on his or her skin color. That’s unfortunate because having worked for the San Jose Police Department for 21 years, I can assure any reader that our officers do not police this way. The idea that an officer will kiss his or her kids goodnight then jump into his or her patrol car to start a midnight shift with the thought of “I’ll go get me a Latino tonight” is offensive to all our officers. statistics bear out that minority citizens stand a far higher chance of being the victims of crime. 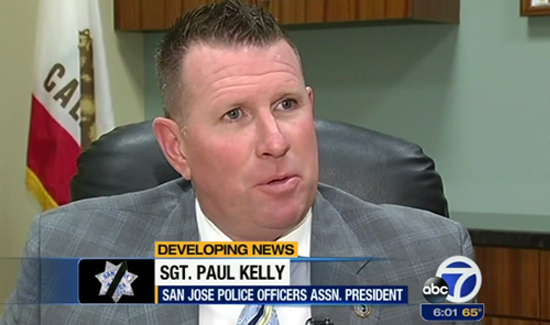 San Jose Police Department is one of the most progressive in the nation. It is also one of the best trained. But our officers need to be prepared to continue to learn and to interact with our citizens in a way that best engenders mutual trust. I believe that the citizens also owe their police officers a commitment. Citizens should challenge our police officers with questions and they should demand answers. But equally, citizens must be prepared to listen to the facts, the accurate statistics, and understand why we police officers conduct ourselves in the way that we do. Relationships are a two-way street. The one between police and citizens is no different. We WILL listen, respond, and come half way or more if need be. I ask San Jose and all the groups fighting on behalf of minorities and victims of hate to NOT put your ‘Hands Up’ but put your ‘Hands Out’. Reach out to us for introductions and a handshake to start the conversation and we will do the same! Back to those two young African American teenagers I talked about at the beginning of the article: I interacted with both, right after the stare. I didn’t detain them or try to develop a case on them. I wanted to see if I could change that look on their face, and I did. So I rolled down the window of my police car and yelled out, “Hey, guys, how are you doing?” They both stopped, said hi, and asked me how I was. I replied I was good, and just wanted to tell them to have a good night. Hearing their young kid voices say thanks and take care was great. Their faces lit up and just smiled as they walked off. They were undoubtedly surprised by our interaction. Perhaps it was the first time they had shot the breeze with a police officer like that. For me, it was the first time I had purposely done this BECAUSE they were black. I have stopped and said hi to hundreds of citizens in my career, no matter what color or creed. But it was new for me to think of doing so simply because of these two young men’s ethnicity. Do we have to think more like this? I believe so. Think more of reaching out, connecting with our community, to understand we all are human and need to be respected whether black, white, uniform, or not. Law enforcement has changed, and will continue to be fluid. We have to be as well. I feel its unpatriotic to not support law enforcement. You will always have my sons and my support. I pray for your safety every day. Reconciliation is well written, thoughtful and timely. Modern police departments are staffed by personnel that have passed an intense selection process. A good selection process combined with good training and discipline accounts for the very few incidents that are in the news and account for a very small percentage of departments and officers. The thought “The minority citizen may really believe that you are looking at him or her based only on his or her skin color. That’s unfortunate… I can assure any reader that our officers do not police this way. The idea….is offensive to all our officers.” Has been rolloing around my head for a few months now, making me sad, however couldn’t express it this well!! I LOVE!!! “NOT put your ‘Hands Up’ but put your ‘Hands Out’” & Relationships are a two-way street…. We WILL listen, respond, and come half way or more if need be. Citizens should challenge our police officers with questions and they should demand answers. But equally, citizens must be prepared to listen to the facts, the accurate statistics, and understand why we police officers conduct ourselves in the way that we do.” So simple and true – WELL DONE!. Thank you for taking the time to say hi to those young men and writing this lettter!!! Well done! I believe all of us in Law Enforcement are reasonable for our public relations. We too often forget that we can still be friendly while maintaining tactics. We to often have a “negative” interaction with people, we need to work on having a positive non-police type contacts. God Bless and Be Safe! Well said and at a time when it is very necessary unfortunately in our country. The hands reaching out was beautiful!! Thank you for speaking on behalf of all police current and retired. As the mother of a police officer and S.W.A.T. instructor, I am impressed by your article and want you to keep writing them. It seems to be your calling in life.